The total flight time – 1 hour. Driving time from Pantnagar to Nainital – Approx 2 h 7 min (68.0 km). 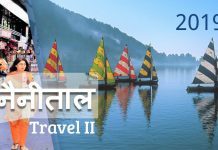 Nainital is one of the most visited tourist destinations in India but places located near Nainital are a perfect fusion of hill stations, trekking spots, adventure activities and wildlife sanctuaries.